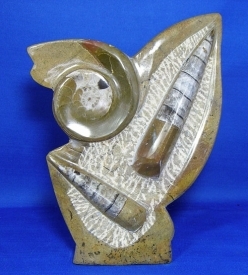 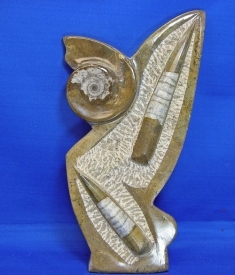 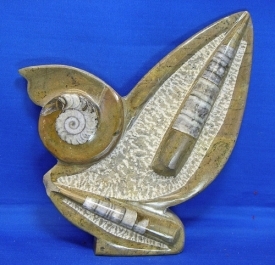 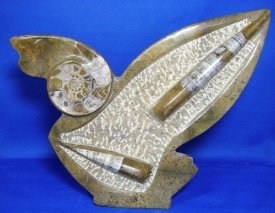 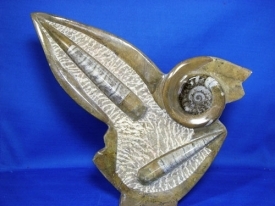 ANCIENT FOSSIL SQUIDS WILL ADD A NEW SEGMENT TO YOUR COLLECTION, DECORATIVE SCHEME, OR CONVERSATION PIECES. 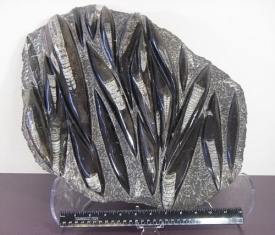 ORTHOCERAS ARE A SPECIES OF EXTINCT SQUID TYPE CREATURES THAT WERE MEMBERS OF A GROUP CALLED ORTHOCONE NATILOIDS. 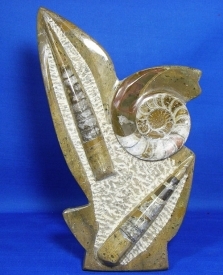 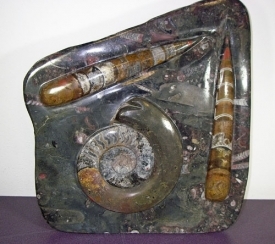 THE ORTHOCERAS HAVE STRAIGHT SHELLS RATHER THAN THE COILED AMMONITES. 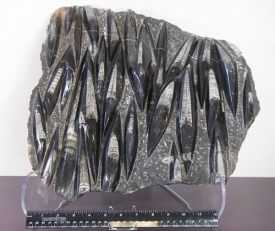 WHEN THEY DIED, THE CURRENTS LINED UP THE SHELLS IN ROWS WHICH SHOW UP IN THESE FOSSIL DISPLAYS . 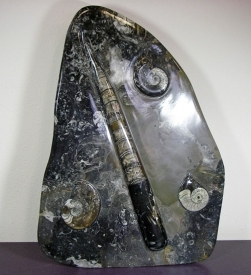 THESE ORTHOCERAS FOSSIL SQUID STANDS ARE FROM SOUTH EAST MOROCCO AND ARE IN BLACK LIMESTONE. 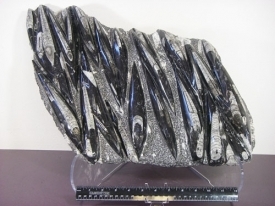 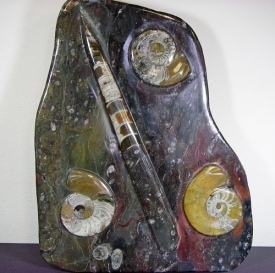 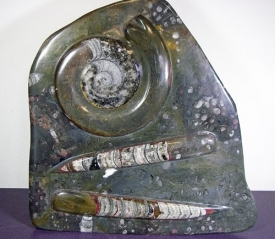 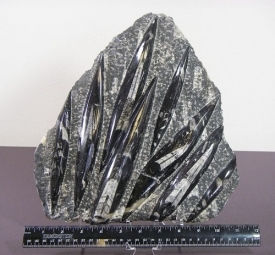 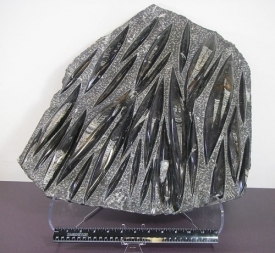 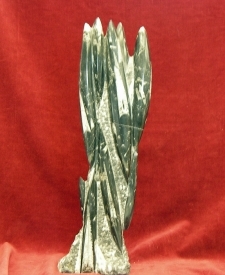 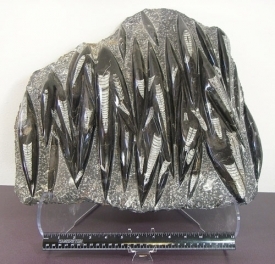 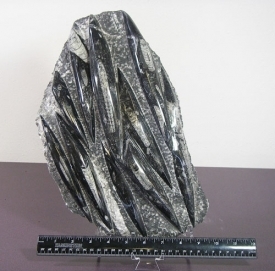 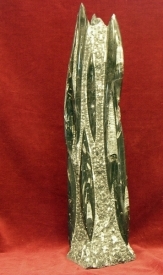 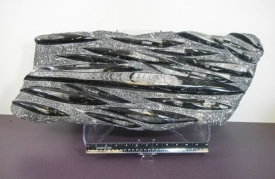 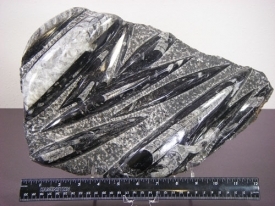 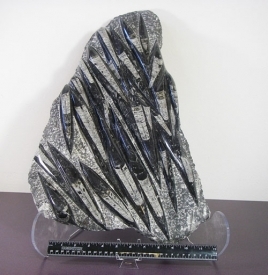 ORTHOCERAS ARE FROM THE DEVONIAN PERIOD AND ARE APPROXIMATELY 400 MILLION YEARS OLD.